Velux™ 2 is a Short Wave Infrared (SWIR) signaling beacon developed specifically to emit a flash pattern signal that can be synchronized with other Velux 2 beacons so they flash in unison. With several beacons deployed, synchronized flash patterns are recognized by operators and commanders in less than half the time as traditionally coded beacons. Faster squad recognition along with a dramatically reduced incidence of confusion with small arms fire extends this beacons capabilities well beyond that of traditional programmable beacons. The Velux 2 has the capability to store two user-selectable flash patterns in memory. The first code pattern is a fixed flash rate code identical to the Phoenix Jr. (NSN: 5855-01-438-4588). The second code pattern is user programmed. The operator can easily switch between each of the encoded flash patterns or a standby mode via the beacons programming pins. The standby mode allows the beacon to put in a sleep setting where no flash pattern is broadcast allowing it to be switched from standby to ON without disconnecting the battery. Both of the Velux 2’s flash patterns can be synchronized by using the beacons themselves. 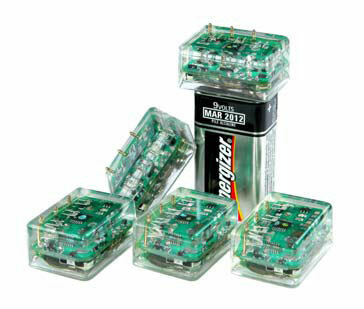 The beacons non-volatile memory allows the battery to be removed from the beacon without erasing any of the entered codes. Code Memories: Two; Phoenix Jr. fixed flash rate, and one user defined. Operating depth: The Poseidon — Phoenix / Pegasus Mounting Clip (902801) provides a water tight casing for the beacon and battery assembly.